I don't think they are talking about Night Vision Scopes! I just unpacked a newly acquired Aquila III 6x and was blown away by the heft and size!!!! I picked up a 6x Raptor at a gun show several years ago and was shocked at it's size. I have not seen a Aquila 6x scope but looking at your picture it's very large also. Oh, gee. Wes your KITE is now Gen 3, 1X and works better than a pvs-22. God I love projects. 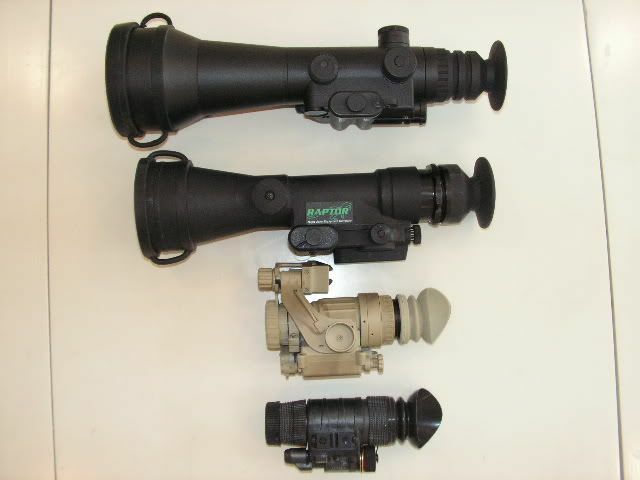 Top to bottom; D-760, Raptor 4X, PVS-14 and MUM. I really am having a hard time posting pics.......Help! Wes, how do I post + feedback for you. I'm the FNG here. Tomorrow I should be able to post some pics of the KITE on my Remington R8 in .338 Lapua. I had an issue with the arms mount on the KITE and having it not exactly co-witness on the MARS rail. And thanks IPSC_GUY for the help with pics!